For other ships with the same name, see French ship Libre. The Libre was a Romaine-class frigate of the French Navy. She was commissioned in 1800 and remained in active service until captured by the Royal Navy in 1805. Libre was built at Le Havre, launched in 1796, and commissioned there on 24 December 1800 under Commander Bourdet. She sailed from Le Havre in March 1801 in the company of Indienne towards Cherbourg, then Cadiz and La Corogne, before cruising to Saint-Domingue and into the North Sea. On 24 December 1805, HMS Egyptienne and HMS Loire captured her six leagues north-west of Rochefort, near the "Phare de Baleines" (Lighthouse of the Whales) on the Île de Ré. Libre suffered two killed and 18 wounded, including her captain, Commander Deschorches. Loire had no casualties but Egyptienne had eight men wounded, one mortally. By British report, Libre was armed with twenty-four 18-pounders (which had replaced her originally-planned 24-pounders), six 36-pounder obusiers and ten 9-pounder guns. Libre was badly damaged and lost her masts soon after she struck. Loire then took her in tow and reached Plymouth with her on 4 January 1806. 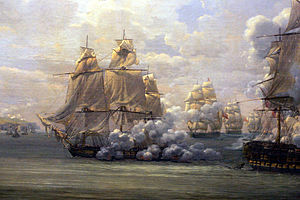 The British did not take Libre into Royal Navy service. ^ Bourdet had been promoted to Captain and appointed to command the naval station of Meuse (Quintin, p.81). ^ a b "No. 15876". The London Gazette. 28 December 1805. p. 1625. ^ Lloyd's List, no.4285, accessed 17 February 2014. Quintin, Danielle; Quintin, Bernard (2003). Dictionnaire des capitaines de Vaisseau de Napoléon (in French). S.P.M. ISBN 2-901952-42-9. Roche, Jean-Michel (2005). Dictionnaire des bâtiments de la flotte de guerre française de Colbert à nos jours. 1. Group Retozel-Maury Millau. p. 280. ISBN 978-2-9525917-0-6. OCLC 165892922.